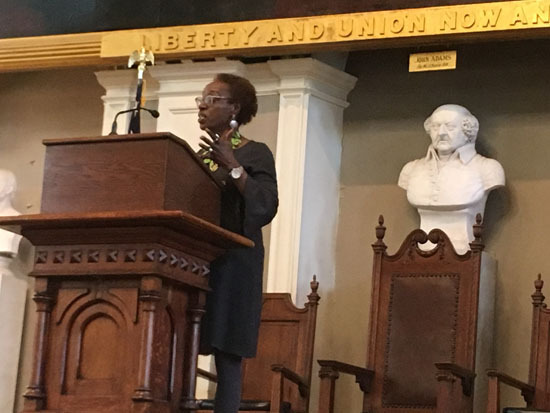 The irony of the setting was striking as I gave the keynote address at the Massachusetts Chapter of the National Association of Social Workers Legislative Education and Advocacy (LEAD) Day on March 25. A highlight of the celebration of National Social Work Month, LEAD united 700 social work students and faculty from across the state to learn about the legislative process, and to underscore the importance of advocacy for policies that matter to social work clients and the profession. This year, the LEAD program started with a morning program in Boston’s historic Faneuil Hall, followed by a march up Beacon Hill to the Massachusetts State House for a day of advocacy and networking with legislators. I stood before 700 of my colleagues on that chilly morning, gathered in what was coined “The Cradle of Liberty,” where the liberation of our nation was conceived, and on land that was donated to the city of Boston by Peter Faneuil—an 18th-century merchant who made his fortune in the slave trade and was a slaveholder. What would Mr. Faneuil think of this gathering, I wondered, with remarks being made by an educated black woman from a small town outside of Augusta, Georgia? Perhaps he would assume I was being brought to one of the slave auctions that were often held steps away on Merchants Row? Throughout the existence of the United States, the dominant white population has used nativist and racist beliefs to support exclusion, exploitation, and restriction that helped to create the ideology of modern racism. This widespread problem has continued into the 21st century with determined insistence, and has led to a host of problems and a fractured society. We are seeing threats to our security, challenges to the right to vote, and a troublesome civil discourse. Too many of our family and friends suffer discrimination and harm because of their skin color, because they are poor, where they go to school, where they are from, where they live, where they worship, or where they use the bathroom. If we are to eradicate racism, we must examine the root causes that influence the dynamics of systemic racism. There exists today a cohesive structure of reinforcement and continuation of racism my colleagues and I have termed “scaffolding.” The strength of the scaffolds holds in place racial discrimination and prevents the morphing and collapse of racism. It is the structural stability of the scaffolding, based on interchangeable parts and cross bracing, that has enabled and promoted the evolution of racism to forms that are now more sophisticated and often less capable of being identified. And it is the scaffold itself that is being attacked through models and antiracism. The many conceptual models that comprise the broader concept of antiracism are useful for understanding contemporary antiracism movements, such as Black Lives Matter and the Civil Rights Movement. All models emphasize some form of resistance directed at deconstructing the rungs and poles of systemic racial scaffolding with the ultimate goal of eliminating oppression. Antiracism is an active way of seeing and being in the world in order to transform it. As an approach that implements social justice, its goal is central to improving the quality of life or well-being in individuals, groups, and communities. According to Dominelli (2002), antiracism needs to encompass all aspects of social life, including culture, institutions, legal and political systems, socio-economic infrastructure, and interpersonal relationships, as well as being able to work in a way that does not endorse any hierarchy of privilege or oppression. It was uplifting to be in the company of 700 of my fellow social workers on LEAD Day, knowing that through their work and compassion we might be able to break down the walls that divide us. And I understood that as we are faced with a moment of great urgency to discuss race in America, people of concern and goodwill continue to seek frameworks in which to discuss such a socially charged topic. It must therefore be true that anything that is scaffolded can be unlearned. — Johnnie Hamilton-Mason, PhD, MSW, is a professor at Simmons School of Social Work where she cofounded the Pharnal Longus Academy for Undoing Racism in 2005. Hamilton-Mason coauthored a book published in fall 2018 titled Systemic Racism in America: Its Perpetuation Through Scaffolding. Dominelli, L. (2002). Anti-oppressive social work theory and practice. New York, NY: Palgrave Macmillan.